Virginia Sen. Tim Kaine aggressively challenged Indiana Gov. Mike Pence over a long list of Donald Trump's controversial positions and statements Tuesday night, drawing a vigorous defense from the Republican No. 2 on Trump's tax history. But Pence left Trump's demeaning comments about women, Barack Obama's citizenship and broader questions about temperament go largely unchallenged. Pence and Kaine, who have received little attention in a race focused on Trump and Hillary Clinton, faced off for 90 minutes in the only vice presidential debate of the campaign. With the close White House race perhaps starting to tip in Clinton's favor, Pence outlined a detailed conservative agenda on tax policy, entitlements and immigration. He was strikingly more prepared and more detailed in his answers than Trump was in last week's first presidential debate. He was also more consistent in painting the Democratic ticket as career politicians unwilling to shake up Washington. "Hillary Clinton and Tim Kaine want more of the same," Pence said. During the vice presidential debate on Oct. 4, 2016, Tim Kaine lists the comments that Donald Trump has made about various individuals and groups, including calling Mexican immigrants rapists and women slobs and pigs. There was a striking difference in the two men's manner. Kaine, Clinton's usually easygoing No. 2, went on the attack from the start, repeatedly interrupting and challenging Pence. Pence, an equally genial politician, was unflappable. Kaine pressured Pence to answer for some of his running mate's provocative statements, using Trump's own words such as dismissing some women as pigs or slobs. He also challenged Pence on Trump's decision to break with decades of campaign tradition by not releasing his taxes. "Donald Trump must give the American public his tax returns to show he's prepared to be president, and he's breaking his promise," Kaine said. Asked about reports that Trump might not have paid any federal taxes for years, Pence said his running mate "used the tax code just the way it's supposed to be used, and he did it brilliantly." Records obtained by The New York Times showed Trump suffered more than $900 million in losses in 1995 that could have allowed him to avoid paying federal income taxes for as many as 18 years. Kaine, too, defended his running mate's weaknesses, chiefly the public's questions about her honesty and trustworthiness. He said that while Trump was "selfish," Clinton had devoted her career to helping children and families. On national security, Kaine revived Trump's frequently flattering comments about Russian President Vladimir Putin. "He loves dictators," Kaine said. "He's got like a personal Mount Rushmore: Vladimir Putin, Kim Jong Un, Moammar Gadhafi and Saddam Hussein." Pence tried to flip the tables by accusing Kaine's running mate of stoking Russia's belligerence. 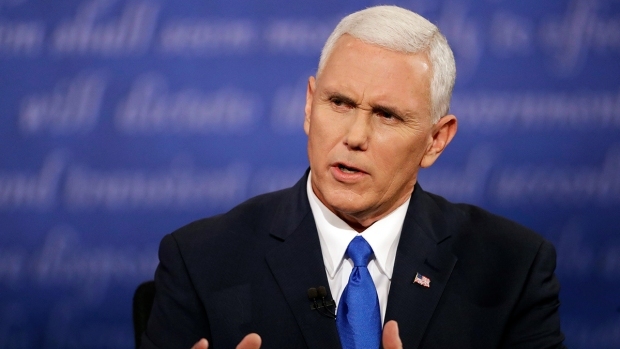 "The weak and feckless foreign policy of Hillary Clinton and Barack Obama has awaked an aggression in Russia that first appeared in Russia a few years ago," Pence said. "All the while, all we do is fold our arms and say we're not having talks anymore." On criminal justice, Kaine argued that Trump's embrace of "stop and frisk" style policing was a mistake. Pence argued that Clinton has used police shootings to argue that there is "implicit bias" in police departments, and he said the Democrats should "stop seizing on these moments of tragedy." 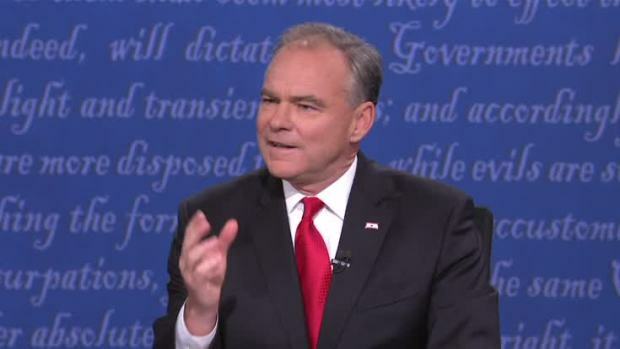 Kaine quickly shot back: "I can't believe you are defending the position that there's no bias." Pence: "Thank you to Norwood University." Kaine and Pence are far less familiar to most Americans than their running mates, who are among the most well-known figures in the country. Both vice presidential candidates have spent years in politics, are well-liked by colleagues and are deeply religious. While their performances were unlikely to dramatically change the way voters view Trump and Clinton, the nationally televised debate was nevertheless a spotlight opportunity for to introduce themselves to Americans, energize party loyalists and potentially sway the shrinking pool of undecided voters. Tuesday's contest was the only time Kaine and Pence will face off in this election, while Trump and Clinton tangle in three contests. Clinton was widely viewed as the winner of her opening debate with Trump, rattling the real estate mogul with jabs about his business record and demeaning statements about women, and responding to his attacks with calm rejoinders. New public opinion polls have showed her improving her standing in nearly all battleground states. At least some of Clinton's bounce is likely attributable to Trump's conduct coming out of the debate. He redoubled his criticism of a beauty queen and her weight, one of the topics Clinton raised in the debate, and went on a pre-dawn Twitter tirade trying to disparage the former Miss Universe. While Trump has five weeks until Election Day to regain his footing, early voting is already underway in some states. The vice presidential showdown at Virginia's Longwood University was moderated by Elaine Quijano of CBS News. 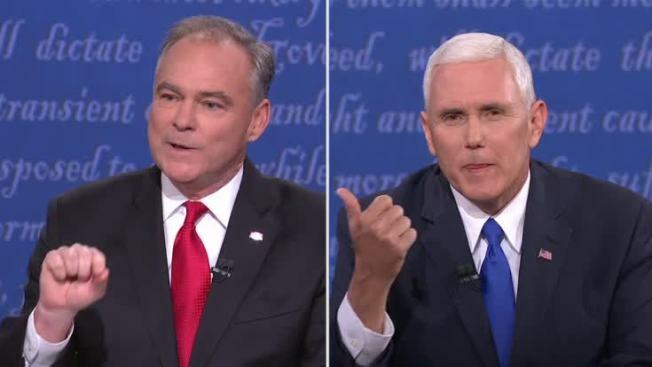 While last week's first presidential debate was watched by a record-setting television audience of 84 million people, Tuesday's contest was expected to have smaller viewership given Pence and Kaine's lower profiles in the campaign. 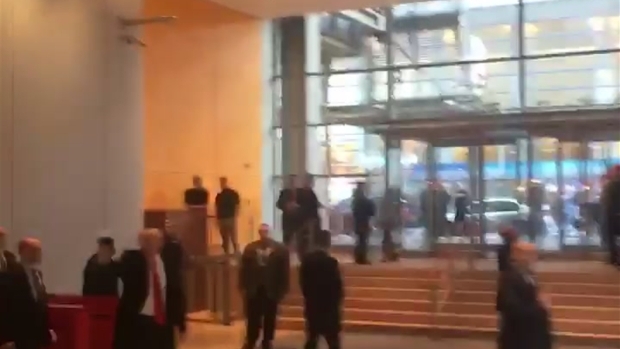 Trump watched the debate from his Las Vegas hotel and couldn't resist a piece of the night's spotlight, promising to live-tweet the proceedings from his famed Twitter account. He weighed in with a few short thoughts — including "Both are looking good! Now we begin!" and then "@mike_pence is doing a great job - so far, no contest!"